Prof. Rigas Doganis has acted as aviation consultant and strategy adviser to numerous airlines, airports, banks and governments around the world. He is currently a non-executive director of easyJet, Europe’s second largest low-cost airline, and was previously a non-executive director of South African Airways. He sits on the Board of Hyderabad Airport in India and is Chairman of the European Aviation Club in Brussels. <div>Prof. 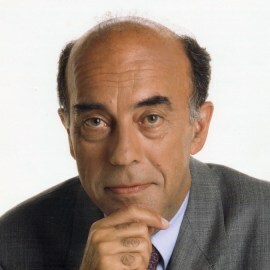 Doganis served as Chairman and CEO of Olympic Airways in Athens from Feb-1995 to Apr-1996 and successfully implemented a major restructuring programme which produced Olympic’s first profit in 18 years. He set up and headed the Department of Air Transport at Cranfield University (UK) from 1991 until 1997 and established it as the pre-eminent academic centre in Europe for post-graduate teaching and research in air transport. He is now a Visiting Professor at Cranfield. From 1976 until 1992 he was Visiting Professor in Airline Management at the Asian School of Management in Manila. Prof. Doganis has acted as aviation consultant and strategy adviser to numerous airlines, airports, banks and governments around the world. He was until recently a non-executive director of easyJet, Europe’s second largest low-cost airline, and was previously a non-executive director of South African Airways and of  Hyderabad Airport in India.